Refer to the exhibit. Host A is communicating with host F. What happens to a frame sent from host A to host F as it travels over the Ethernet segments? • The frame format is modified as it passes through each switch. • The frame format remains the same across each Ethernet segment. • The frame format is modified as the media speed changed at switch B and switch E.
• The frame format is modified as the media material changes between copper and fiber at switch C and switch D.
2. How many hexadecimal digits are in a MAC address? • A NIC connects the PC to the network media. • A NIC detects collisions on the Ethernet segment. • A NIC checks the formatting of data before it is transmitted. • A NIC passes the contents of selected frames to the upper OSI layers. • A NIC acknowledges and retransmits data that was not received properly. • A NIC discards frames when the destination IP address does not match the local host. 4. At what layer of the OSI model does a MAC address reside? 5. A router has an Ethernet, Token Ring, serial, and ISDN interface. Which interfaces will have a MAC address? 6. In an Ethernet LAN, how does the NIC know when it can transmit data? • An Ethernet NIC transmits data as soon as the frame is received. • An Ethernet NIC transmits data as soon as the NIC receives a token. • An Ethernet NIC transmits data when it senses a collision. • An Ethernet NIC transmits data after listening for the absence of a signal on the media. 9. On a local area network, one workstation can send data on the line while it is receiving data. What type of data transfer does this describe? Refer to the exhibit. The small office network shown in the exhibit consists of four computers connected through a hub. Which configuration would cause collisions and errors on the network? Refer to the exhibit. The switch and workstation are administratively configured for full-duplex operation. Which statement accurately reflects the operation of this link? • No collisions will occur on this link. • Only one of the devices can transmit at a time. • The switch will have priority for transmitting data. • The devices will default back to half duplex if excessive collisions occur. • Hosts 1 and 4 may be operating full duplex so no collision will exist. 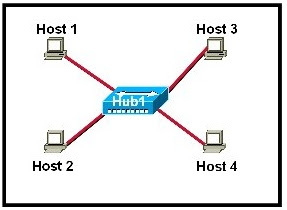 • The hub will block the port connected to Host 4 to prevent a collision. • After the end of the jam signal, Hosts 1, 2, 3, and 4 invoke a backoff algorithm. • Hosts 1 and 4 are assigned shorter backoff values to provide them priority to access the media. • If a host has data to transmit after the backoff period of that host, the host checks to determine if the line is idle, before transmitting. 13. When a collision occurs in a network using CSMA/CD, how do hosts with data to transmit respond after the backoff period has expired? • The hosts return to a listen-before-transmit mode. • The hosts creating the collision have priority to send data. • The hosts creating the collision retransmit the last 16 frames. • The hosts extend their delay period to allow for rapid transmission. 14. Which statement describes how CSMA/CD on an Ethernet segment manages the retransmission of frames after a collision occurs? • The first device to detect the collision has the priority for retransmission. • The device with the lowest MAC address determines the retransmission priority. • The devices transmitting when the collision occurs DO NOT have priority for retransmission. Refer to the exhibit. A technician wants to increase the available bandwidth for the workstation by allowing the switch and the NIC on the workstation to transmit and receive simultaneously. What will permit this? 16. Why do hosts on an Ethernet segment that experience a collision use a random delay before attempting to transmit a frame? • A random delay is used to ensure a collision-free link. • A random delay value for each device is assigned by the manufacturer. • A standard delay value could not be agreed upon among networking device vendors. • A random delay helps prevent the stations from experiencing another collision during the transmission. 19. Where does the MAC address originate? NAT translates public addresses to private addresses destined for the Internet. Only one company is allowed to use a specific private network address space. Private addresses are blocked from public Internet by router. Network 172.32.0.0 is part of the private address space. IP address 127.0.0.1 can be used for a host to direct traffic to itself. Refer to the exhibit. Host A is connected to the LAN, but it cannot get access to any resources on the Internet. The configuration of the host is shown in the exhibit. What could be the cause of the problem? The host subnet mask is incorrect. The default gateway is a network address. The default gateway is a broadcast address. The default gateway is on a different subnet from the host. Given the IP address and subnet mask of 172.16.134.64 255.255.255.224, which of the following would describe this address? This is a useable host address. This is a broadcast address. This is a network address. This is not a valid address. A router interface has been assigned an IP address of 172.16.192.166 with a mask of 255.255.255.248. To which subnet does the IP address belong? What subnet mask would a network administrator assign to a network address of 172.30.1.0 if it were possible to have up to 254 hosts? Which process do routers use to determine the subnet network address based upon a given IP address and subnet mask? Which of the following is a characteristic of DHCP? Refer to the exhibit. Which network prefix will work with the IP addressing scheme shown in the graphic. Refer to the exhibit. The network administrator has assigned the internetwork of LBMISS an address range of 192.168.10.0. This address range has been subnetted using a /29 mask. In order to accommodate a new building, the technician has decided to use the fifth subnet for configuring the new network (subnet zero is the first subnet). By company policies, the router interface is always assigned the first usable host address and the workgroup server is given the last usable host address. Which configuration should be entered into the workgroup server’s properties to allow connectivity to the network?